Pink Floyd news :: Brain Damage - Exhibition touring Germany: "Hipgnosis. Daring to Dream." Exhibition touring Germany: "Hipgnosis. Daring to Dream." 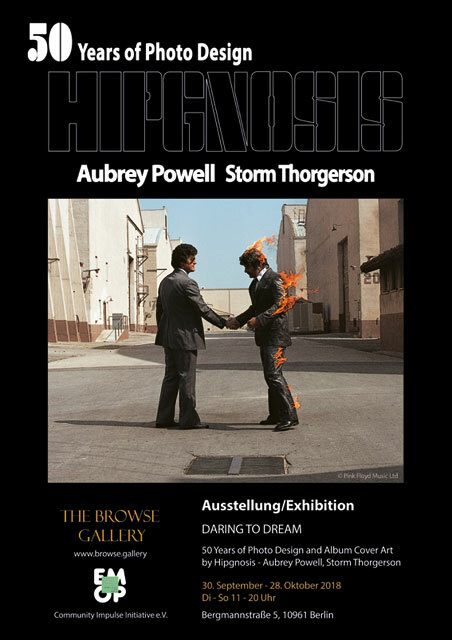 Five years after the passing of Storm Thorgerson, Aubrey "Po" Powell was approached by a gallery with a wish to stage an exhibition of the work of Hipgnosis. Po agree after some initial hesitation, and the result - "Hipgnosis. Daring to Dream" - which celebrates 50 years of their design work, is currently touring Germany. Back in September it was held in Berlin; it is now (until February 24th, 2019) at the Kunsthalle Lüneburg. UPDATE: From March 16th - April 30th, it can be found at the Küstenmuseum Wilhelmshaven. With nearly 100 pieces, definitely worth a visit. It's open each week Tuesday through to Sunday, 11am - 5pm. Our thanks to Michael Diers for this information! The British graphics agency Hipgnosis created record covers in the 1970s that became museum masterpieces. From 19th January to 24th February 2019, the Kunsthalle Lüneburg will be showing a selection of the most important record covers in the history of music by the legendary graphics studio of Aubrey Powell in large screen prints as well as numerous photographs by the founder of Hipgnosis. 1968 is considered the core year of the cultural revolution. It is also the year of birth of Hipgnosis, the legendary British photo design studio founded by Aubrey Powell and Storm Thorgerson. Powell and Thorgerson worked together for fifteen years (1968-1983) under the umbrella of Hipgnosis. At this time, they designed more than 350 record covers, including some of the most famous in music history: The Dark Side of the Moon, Wish You Were Here, Houses of the Holy, The Lamb Lies Down on Broadway and Scratch. With creative, often surreal visual concepts, subversive humour and radically innovative photo design approaches, Powell and Thorgerson created a whole new way of album cover design. Instead of classical musician portrait photos, their complex photographic compositions creatively leaned creatively on the musical ideas contained in the case. Or they were pursuing an entirely independent image idea that would cause a stir and make the album known - like the cover to Atom Heart Mother showing only a cow in a pasture. These works, described by Powell and Thorgerson as anti-cover, did not refer to the bands or the content of the music. In part, the covers were proposed to several bands at the same time, which Robert Plant took with humour: "What a bunch of daring gamblers you are." Powell and Thorgerson had both studied photography and film at art colleges, revered Duchamps, Magritte, Man Ray, and Dali. Their surreal pictorial concepts and often epic photo landscapes testify to these elective affinities. With their uncompromising visionary ideas, they turned album cover design into popular art that outlasted time, inspired millions of people worldwide, and influenced generations of photo designers in their work. The exhibition shows a selection of the most famous Hipgnosis album covers in large screen prints that were previously shown in Berlin and San Francisco. There's also a series of black and white shots of Syd Barrett, Pink Floyd, The Rolling Stones, Foreigner and Paul McCartney. German television station NDR did a short piece on the exhibition, which can be viewed through this direct link. Po is interviewed, although much of his conversation is obscured with a German translation, rather than subtitles.